Samuel Beckett called words an “unnecessary stain on silence and nothingness”. In Eley Williams’ debut collection, jittery with etymology, the stain is more than necessary. Greasy fingerprints suggest fingers, after all. One word suggests a handful of others. ‘Concision’, for example, opens and closes with precise terms (“One single Finnish word describes the sudden blast of heat that comes after water is poured upon a sauna’s brazier”), sandwiching a split-second when a character stares at a phone’s receiver, tumbling between the black holes, black moons, a magician’s hat and “umlauts trailing in the wake of your absent vowels”. This associative wordplay reads like fingerprints on the page. So too does the story’s moment – an oily smudge from an earlier argument. Several of the stories in Attrib. find themselves in moments like this, after a fight or unwanted separation, when bedrooms ring like gongs. ‘Spins’ opens with Dr Johnson’s definition of the word Spider, then proceeds with similar linguistic attention to consider an arachnid on the ceiling, as well as a door, recently slammed. ‘Platform’ centres on a photograph, blown-up to poster size, taken at the moment of a friend’s departure in a train station. A commuter’s errant toupee is frozen in time, appropriated into association for the dear friend’s lack. The character also sees the friend’s name in alphabet soup and the cries of woodpigeons, or in the smell of their laundry in buddleias, daffodils and marigolds. Williams comes at these stains like a synaesthete, with sounds and associations rippling across the senses. In the titular story a foley artist hears words in the sounds of trees against branches and computer cooling fans. In ‘Smote’ a checkerboard painting by Bridget Riley becomes a garbling of tastes and sounds (“it is Guinness-thick, the choke of it”), skipping between vinyl records and Battenberg cake in the moment of a lover’s hesitation. Sights often become punctuation, asterisks and exclamation marks popping up out of animals and household objects. The rippling of these distortions throughout the collection works brilliantly in places, but sometimes runs the risk of overpowering the stories. ‘Synaesthete, Would Like to Meet’, which follows a synaesthete during and after a date, is full of evocative juxtapositions, but feels unnecessary given the subtler attention to sensory description elsewhere. At other times, the anxiousness to flip and examine each word feels a touch performative, jolting the reader out of the characters’ lives to watch Williams the linguistic lion-tamer. Not that that’s a bad way to spend an afternoon – nearly every sentence here dazzles with somersaults – but some of the book’s most outstanding moments are those that give their images room to breathe. For example, ‘Spines’ and ‘Fears and Confession of an Ortolan Chef’. The former is the only story told in the third person, and that barrier to interiority hones the focus on description and dialogue between the story’s vacationing family, discussing a hedgehog stuck in a swimming pool. Elsewhere Williams’ characters are unable to contain their outpourings of associations, often projecting these onto animals. Here, though, the family is cold, cut-off from the struggling creature in a way that makes the final tragic image all the more powerful for being left to implication. ‘Fears and Confession of an Ortolan Chef’ also centres on a powerful image, of restaurant customers covered in embroidered napkins as they eat songbirds. It is an unsettling tale, simultaneously anxious of its own symbolism (“I grow sick of metaphor and sick of the idea of the bird”). Like ‘Spines’, it is a story rich in stains, but is crafted with enough space for those smears to linger. As well as popping up in the final story, Dr Johnson’s A Dictionary of the English Language opens Attrib., delineating the word Attribution and failing to do so for Trolmydames (“Of this word I know not the meaning”). 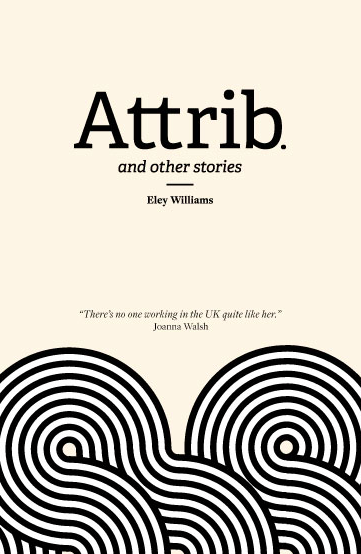 This gulf between knowing and unknowing, meaning and non-meaning, wrinkles throughout Eley Williams’ collection of short stories. Links between sights and sounds cascade between etymologies both historical and personal, graspable and obscure, animal and human. Following these word trails is intoxicating, but Attrib. is ultimately at its best when these linguistic contortions are put to work communicating (or failing to communicate) their characters’ realities. When this happens, Attrib. glints with fingerprints. Attrib. and other stories is published by Influx Press. Author bio courtesy of the same. Posted in Book reviews and tagged Attrib., Eley Williams, etymologies. Bookmark the permalink.